Life was a Formula One constructor from Modena, Italy. The company was named for its founder, Ernesto Vita ("Vita" is Italian for "Life"). Life first emerged on the Formula One scene in 1990, trying to market their unconventional W12 3.5-litre engine. The team had a disastrous single season, and failed to make the grid in all 14 attempted starts during the 1990 season, often clocking in laps many seconds slower than their next competitor. Life's W12, or "broad arrow", machine had been designed by the former Ferrari engineer Franco Rocchi, who had been responsible for, among others, Ferrari's famous 3-litre V8 for the 1970s 308 GTB and GTS. Rocchi's W12 plans dated back to a 1967 single-module W3 of 500cc as a prototype for a 3-litre W18 Ferrari engine of a planned 480 hp. After his dismissal in 1980, Rocchi worked privately on an engine in a W12 configuration. According to his concept, the engine had three banks of four cylinders; hence it was short like a V8 but taller than a regular V-banked engine. In France, Guy Nègre from Moteurs Guy Nègre worked on a similar machine that saw the light of day in 1989 before being tested privately in an out-dated AGS JH22, chassis. Apart from the W12 configuration, both engines bore no other similarities, nor were there any links between their designers. Franco Rocchi's W12 was ready in the first half of the 1989 Formula One season. It was the time when turbocharged engines were no longer legal in Formula One and the rules required a normally aspirated motor. New engine manufacturers entered Formula One (such as Ilmor, Judd and Yamaha), and new ideas broke through. 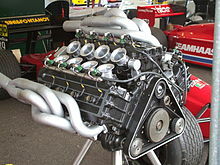 Ferrari and Lamborghini used V12 engines (successfully in the former's case), Carlo Chiti's Motori Moderni unsuccessfully tried to revive flat-12 engines, badged as Subarus and used by the Coloni team, whilst Renault and Honda developed V10 engines, used successfully by Williams and McLaren. In this situation, the Italian businessman Vita hoped for fast money. He bought the rights to the W12 from Franco Rocchi and tried to supply the engine to a well-funded Formula One team. During 1989, he searched for a partner without any success. Finally, he gave up his search and decided to run the engine on his own in the 1990 Formula One season. Therefore, he founded the "Life"-Team, life being the English translation of his family name. The team's headquarters were originally split between the technical offices in Reggio Emilia, and the factory in Formigine, near Modena, then regrouped under the same roof in Formigine. While not having state of the art facilities, the factory was equipped with a "Borghi e Severi" dyno bench and related AVL datalogging computers, which was used for the development of the W12 motor, standard toolshop machines, and a warehouse. Life was not able to build a car on its own. Instead, the team bought the still-born Formula One chassis from First Racing that had been designed by Richard Divila for Lamberto Leoni´s Formula 3000 team. The car had been built up by January 1989 but the promising project was abandoned soon after an initial test with Gabriele Tarquini had taken place. In late 1989, Vita purchased the single chassis and fitted his W12 engine. The major engineering work had been done by Gianni Marelli, another former Ferrari man. The car - now dubbed Life L190 - was ready by February 1990, and tested briefly at Vallelunga and Monza. The Life L190 at Goodwood Festival of Speed 2009. When the new season came, the team had one chassis, one engine, and few if any spare parts. The W12 turned out to be the least powerful engine of the year: its output was 480 hp while others produced 600 to 700 hp. At the same time, the ex-First L190 chassis was one of the heaviest cars in the field at 530 kg. Handling was bad and reliability was poor. As a result, the Life was no faster than a Formula 3 car. Even in Formula 3000, it would have been outclassed. Initially Sir Jack Brabham's son Gary Brabham was signed to drive but when he failed to pre-qualify twice he left the team for good. In the second of his two races the car coasted to a halt after 400 yards with the mechanics on strike revealing they never put oil in the engine. Bruno Giacomelli, an Italian veteran who had last raced in Formula One in 1983, was then signed by the team. The car never managed to run more than eight laps without technical problems. At the 1990 San Marino Grand Prix Giacomelli said that he was scared he might be struck from behind as his car was so slow. At the pre-qualifying sessions for that race, Giacomelli completed his run with a gap of nearly six minutes to the second slowest time. For the Portuguese Grand Prix, the team replaced their own engine with a more conventional Judd CV V8, but then found that the engine cover did not fit; it flew off the car on its first lap of Estoril. They withdrew before the final two Grands Prix. The single Life L190 was fully restored in 2009 and ran at the 2009 Goodwood Festival of Speed with its original W12 engine back in place. The picture shows Arturo Merzario driving the car. Currently the car is owned by a well-known car tuner from Emilia. ^ a b c d e Ludvigsen, Karl (2005). The V12 Engine. Sparkford, Yeovil: Haynes. pp. 356–358. ISBN 1844250040. ^ Jenkinson, Denis (June 1990). "Delusion". Motor Sport magazine archive. p. 6. Retrieved 17 July 2017. ^ Small, Steve (1994). The Guinness Complete Grand Prix Who's Who. Guinness. pp. 157 and 409. ISBN 0851127029. Small, Steve (1994). The Guinness Complete Grand Prix Who's Who. Enfield: Guinness Publishing. ISBN 0-85112-702-9. This page was last edited on 6 December 2018, at 20:28 (UTC).